The Caribbean Community (CARICOM) Marijuana Commission has recommended the decriminalising of marijuana possession, but the Alliance For Change (AFC)- one of Guyana’s governing coalition partners- says it does not want penalties to be removed altogether from the law books. 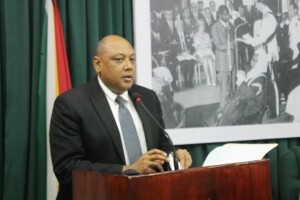 Hours after CARICOM Secretary General, Irwin La Rocque announced in Jamaica that the Commission has recommended that marijuana possession should no longer be a crime and should be classified as a controlled substance, AFC Leader, Raphael Trotman said his party still prefers to see a situation in which the amount is linked to the severity of the penalty. Trotman, himself an Attorney-at-Law by profession, reiterated that the Narcotics and Psychotropic Substances Act must be amended to give magistrates flexibility in sentencing persons. 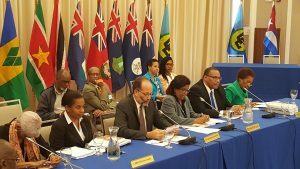 “While we are most interested in reading and analysing the report from the Caribbean Community, the AFC is not interested in decriminalisation but in alternative sentencing that gives a court a discretion rather than having to impose the obligatory three years for 5 grams and more,” said the AFC co-founder and leader. For example, he said, someone with seven grammes of marijuana could be jailed for three years while a person with 70 kilogrammes could get the same sentence. “Something is obviously wrong there and we are interested in re-aligning the law,” he said. La Rocque said the 10-member Commission weighed in on, among other things, the lengthy jail terms for marijuana possession that led them to their overall decision. “In essence, they are recommending the decriminalisation of marijuana. They are recommending it be deemed to be a substance that is controlled and managed as alcohol,” he said. “One thing that I read in the report that stands out so much is that there are in some member states where the penalty for a small amount of marijuana is sometimes more than for some of the other more heinous crimes that are being committed. Now, how can that be…It just defies logic”, he said.